Read most of a 1928 Australian edition of the Kotex booklet Marjorie May's Twelfth Birthday, and read three mid-1930s booklets by Kotex, including a much-changed version of Marjorie May's twelfth Birthday. Read the whole menarche booklet As One Girl to Another (Kotex, 1940). and menstruation booklets for Kotex, etc. 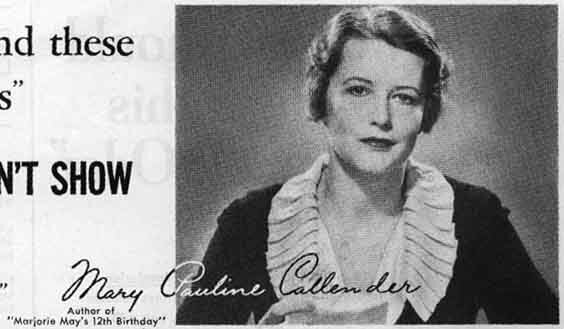 Mrs. Callender [short biography] is credited with writing probably the first Kotex menarche-education booklets for girls and their mothers (start here to see several examples). 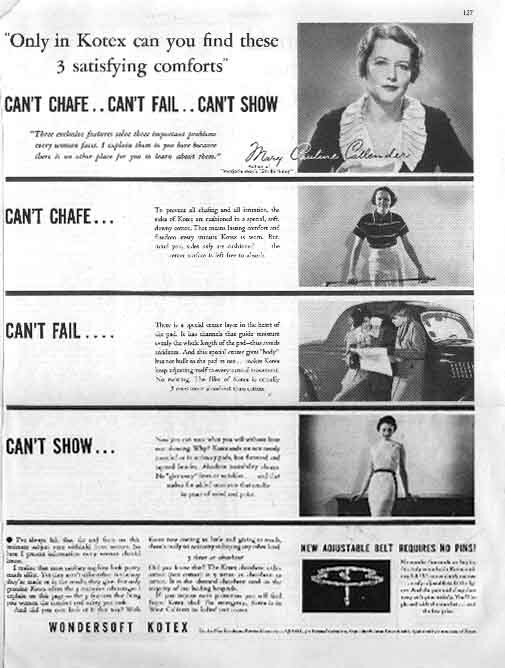 Mrs. Callender might also be the first named actual person in a menstrual-hygiene ad in the United States; see the first pictured one. The ad in which this appears is at the bottom of the page. There is no date, but it looks like it's from the 1930s. This site has several Marjorie May booklets, for example, here. The ad is undated, but it looks as if it's from the 1930s. Marjorie May's Twelfth Birthday, Marjorie May Learns About Life, and Facts About Menstruation that every Woman should know.